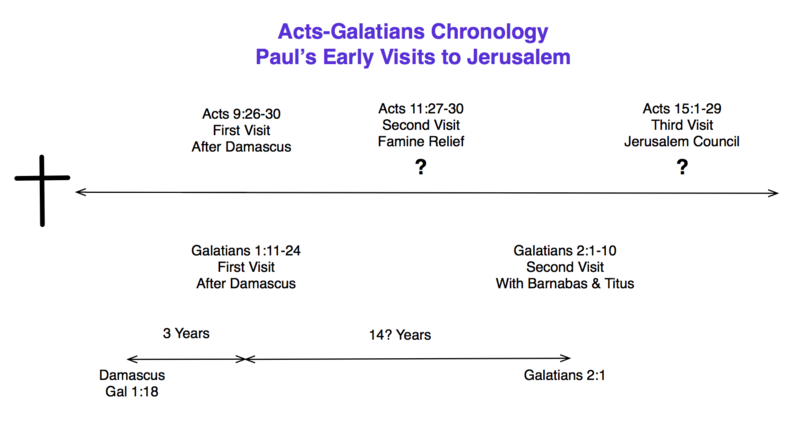 Paul’s Early Visits to Jerusalem: Does Acts Conflict with Galatians? In Acts 15, the first great church council meeting counts as the third visit Paul paid to Jerusalem, after his conversion, according to a face value reading of Acts. But Galatians records only two visits to Jerusalem by Paul. Is the chronology within the Bible in conflict? Skeptics of the Bible like to point out things like this as “errors,” but that judgment is premature. There is much scholarly debate, but historically there are two main theories as to how the problem could be resolved. But without descending into too much detail, there is also a more recent proposal that might better explain the difficulties. Acts records a first visit of Paul to Jerusalem in Acts 9:26-30, following his escape from Damascus, in a basket, lowered by his friends (Acts 9:23-25). The second visit is commonly called the “famine” visit, when Paul and Barnabas are sent from Antioch to deliver help to the church in Jerusalem, in Acts 11:27-30. The third visit, in Acts 15:1-29, Paul has a “public” meeting with the church leaders in Jerusalem, to try to resolve the conflict regarding the status of welcoming the Gentiles into the then Jewish-dominated church. Paul makes at least one more visit later to Jerusalem in Acts, but that visit is not relevant to this chronology problem. Compare this to what we read in Galatians, Paul’s letter to the church there, intended to resolve the dispute over the Judaizers, who wished to impose circumcision on the Gentile believers in Jesus. Paul appeals to his authority as an apostle, called directly by God, to overrule the legalism of the Judaizers. To make his case, in Galatians 1:11-24, Paul tells of being converted by a personal revelation from the Lord Jesus. After spending three years in Damascus, Paul goes to Jerusalem, only visiting the apostles Peter and James, meeting them for the first time. Then, in Galatians 2:1-10, Paul writes of returning again to Jerusalem, “after fourteen years” (Is this fourteen years after his conversion, or fourteen years after his first visit to Jerusalem? We do not know). Paul took Barnabas again, along with Titus, to address the circumcision issue with the Jerusalem apostles (Click on the image below, to expand the image). 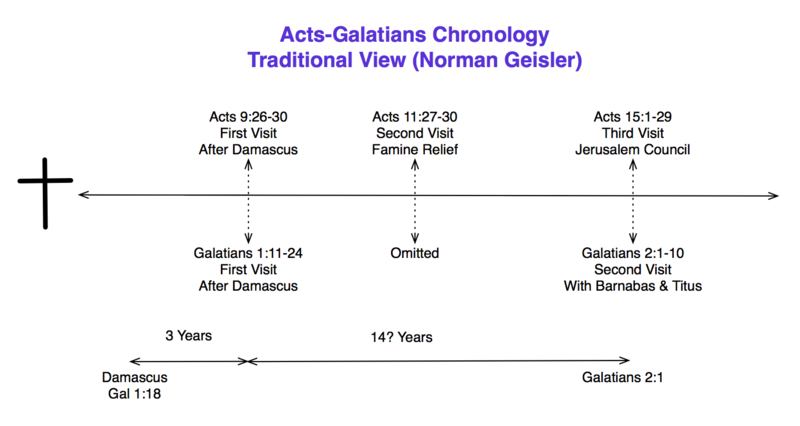 The evangelical apologist Norman Geisler champions the traditional view, namely that this second meeting in Galatians corresponds to the third meeting found in Acts; that is, Galatians 2 = Acts 15. Geisler admits some problems here: (a) Galatians 2 records a private visit, whereas Acts 15 describes a public visit, (b) Galatians mentions nothing about any council decree, whereas Acts 15 specifically mentions a council decree. On the flip side, there is evidence favoring this solution: (a) Luke in Acts 15 is emphasizing the public decision regarding Paul’s message, whereas Galatians is interested in private affirmation of Paul’s call to ministry among the Gentiles; (b) Paul and Barnabas faced stiff opposition in both Galatians 2 and Acts 15; and (c) the persons mentioned in Galatians 2 and Acts 15 more clearly match, as well as the overall timing of the events. The main obstacle with Geisler’s solution is that it suggests that Paul simply omitted the mention of a third visit to Jerusalem, as described in Acts. Yet Galatians specifically spells out a total of two visits to Jerusalem by Paul, and no more. Omitting the description of a third visit would probably raise some suspicion by Paul’s critics, and does not adequately remove from the reader the specter of error in the Bible. After all, Paul’s driving point is that he gets his apostolic calling directly from revelation, and not from any man, not even the Jerusalem apostles (Galatians 1:11-12). He was basically unknown to the churches of Judea, prior to the meeting in Galatians 2 (Galatians 1:22). If Paul were to ignore yet an extra visit to Jerusalem, it would tarnish Paul’s credibility. 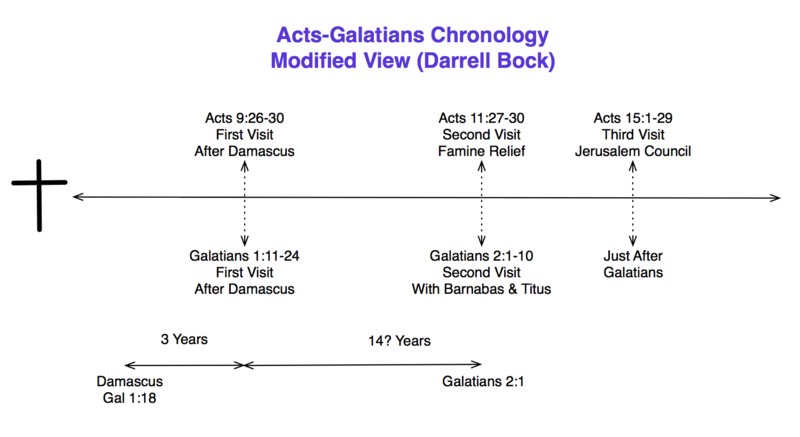 Dallas Seminary and New Testament scholar Darrell Bock champions a different solution, associating the Acts 11:27-30 visit with the Galatians 2:1-10 visit; that is, Acts 11:27-30 = Galatians 2:1-10. He cites three main reasons to support this view: (a) In Galatians, Paul’s second visit is instigated by a “revelation” (Galatians 2:2), and this could tie in with the prophecy of Agabus in Acts 11; (b) Paul mentions that he desired to “remember the poor” in the second visit of Galatians (Galatians 2:10), and this affirms the reason mentioned in Acts 11 for that visit to Jerusalem, namely to offer a gift to the church there, to aid in famine relief; and (c) the problem being addressed in Galatians 2 concerns having table fellowship with Gentiles, whereas the controversy in Acts 15 is about circumcision, making it less likely that the incidents are the same. Bock’s solution does have its difficulties. It assumes that Galatians was written before the events described in Acts 15, and in general, it moves up the time table traditionally associated with the movements of Paul. Combined with some skepticism over the interpretation of the positive points of evidence mentioned by Bock, not all scholars find the assumptions proposed by supporters of Bock’s solution to be agreeable: (a) Paul’s revelation may not be related to the prophecy of Agabus. As in much of Paul’s writings, Galatians indicates more that the “revelation” had to do with Paul himself, and not necessarily something to do with another person, like Agabus; (b) there is no requirement to assume that the call to “remember the poor” be limited only to one visit; and (c) the issue of table fellowship with the Gentiles derives directly from the controversy over circumcision, as well as the Jewish food laws. It need not be separated. More recently, Duke University New Testament scholar Mark Goodacre proposes a newer solution that should be taken seriously, in view of the difficulties associated with the previously proposed solutions. To understand Goodacre’s solution, it requires the student of Scripture to have a better understanding of the genre of the Book of Acts. According to New Testament scholar, Michael Licona, most scholars today recognize that the Gospels, as well as the Book of Acts, can be shown to take the literary form of Greco-Roman biographies, the “bios” genre. Greco-Roman biographers were concerned about chronology, but not in the same manner as modern biographers and historians are today. Unlike modern biographies, Greco-Roman biographies do not share the same degree of precision when it comes to narrating the chronology of historical events. Greco-Roman biographies were known at times to sacrifice certain precise details of chronology, in order to achieve other literary aims, namely, to highlight the character of the person or persons being studied. In other words, the writers of the Gospels and Acts were not required to follow the literary standards of doing biography and history that we would require today. Instead, they would follow the literary standards commonly accepted in the Mediterranean cultures of the first century. Licona’s thesis in Why Are There Differences in the Gospels? : What We Can Learn from Ancient Biography gives examples of how the New Testament authors would use various compositional devices in order to achieve the literary aims of those authors. Perhaps there is a Greco-Roman compositional device associated with Acts that can help relieve the chronological problems reconciling Acts and Galatians. Mark Goodacre finds agreement with the positive case, presented by those like Norman Geisler, that the so-called third visit in Acts to Jerusalem, in Acts 15, is the same as the second visit in Galatians, in Galatians 2. There is a long history of accepting this view, going back as early as the church father of the 2nd century, Irenaeus. Paul (then Saul) escapes via the basket from Damascus (Acts 9:23-25). Paul then makes his way to the area of Tarsus, his home town, and eventually arrives in Antioch, to receive the gift of the believers there, to be given to the elders of the Jerusalem church to aid in famine relief (Acts 11:25-30). Paul and Barnabas go to Jerusalem, the first visit described in Galatians 1:11-24. This is also the same visit described in Acts 9:26-30. Paul is then brought to Caesarea, and then sent off to Tarsus, per Acts 9:30. Years later, after Paul’s first missionary journey, Paul and Barnabas, along with Titus, go to Jerusalem for both a private meeting with the apostles, to affirm Paul’s call to ministry, as well as to participate in the public church debate over the Jewish/Gentiles controversy, leading to the decision of the Jerusalem council in Acts 15. Therefore Acts 15 and Galatians 2 describe the same incidents. 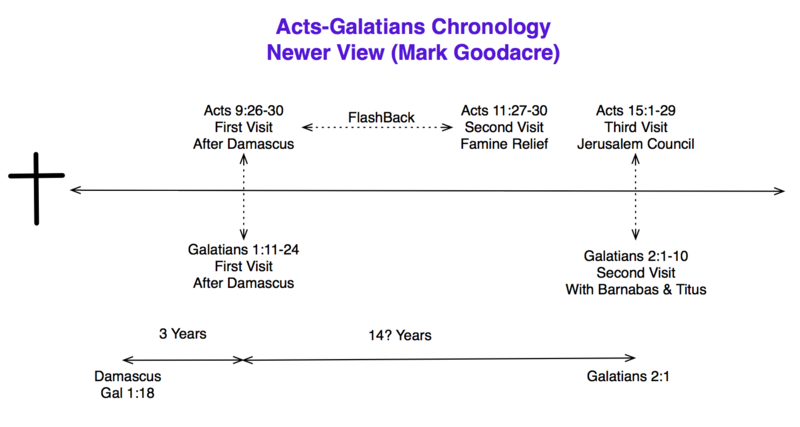 Goodacre describes Acts 9 as a type of “flash forward” of the events described in Acts 11. But it might be better to think of Acts 11 as a “flashback” to the events of Acts 9, which might fit in well with the use of such compositional devices found in other Greco-Roman biographies. It would be reasonable to suggest that Luke effectively repeats the story of Paul’s first visit to Jerusalem, between Acts 9 and Acts 11, to tie those passages together. In the interim, Luke in Acts 9:32 to Acts 11:18 picks up the story of Peter, specifically focusing on the story of Cornelius, the Gentile Roman military officer, and his conversion to Christ. Once done with the story of Peter and Cornelius, Luke recalls where he earlier stopped off with telling Paul’s story, and to bring things back to Paul’s first visit to Jerusalem. Why does Luke do this? We can not be completely certain. It is quite possible that Luke’s objective in Acts is to narrate how the church grew from being a Jewish-only movement to becoming a Jewish-Gentile movement, centered around the mission of Paul, a converted Jew to Christ, to share the Gospel with the Gentiles. In other words, Luke selects material from the history of the early church, to focus first on Peter, and then to transition to the character of the apostle Paul. It would only be fitting for Luke to build up the story of how the church overcame the problems between Jew and Gentile, by temporarily highlighting the background and story of Peter’s interactions with Cornelius, before returning to his main narrative, following the apostle Paul. Those who object to this solution might complain that Acts 9 only makes mention of Paul’s movements from Damascus to Jerusalem, with no intervening travels. But this objection is no more a difficulty than the fact that Luke also makes no mention of Paul’s time in Arabia in Acts 9, while operating out of Damascus, as mentioned in Galatians 1:17. It simply was not a concern of Luke’s to mention all of those precise details in his narrative. But perhaps the biggest objection to be raised is the assumption that Luke is rearranging, if not repeating, his chronology in Acts, with respect to Paul’s travels in Acts 9 and Acts 11. It is true that a face value reading of Acts would suggest the presence of three visits to Jerusalem, by Paul, by the time of the Acts 15 Jerusalem council, and not two. Nothing in Acts specifically would indicate otherwise. It is only the desire to reconcile the chronology of Galatians that causes concern. On the other hand, if indeed the Book of Acts is a good example of the Greco-Roman biographical genre, then it should not surprise us to find Luke using compositional devices often associated with that genre. In fact, we should be surprised if Luke did not use such compositional devices in his writing. Mark Goodacre’s solution is not without criticism, and it would be wrong to dogmatically assert this as the only possible answer to this chronological difficulty. The other proposals have their strengths as well. But in light of the growing scholarly consensus as to a common understanding of the first century, Greco-Roman literary context of the Book of Acts, it might be well worth considering Goodacre’s approach as a legitimate solution. This situation causes frustration for some contemporary readers, who desire a resolution to chronological problems, for the sake of preserving biblical inerrancy. For those who wish to defend the Scriptures, some probably wonder why the Scriptural text does not spell things out more clearly. Some might complain that if Luke really wanted us to believe that the so-called first (Acts 9) and second (Acts 11) visits of Paul to Jerusalem were really the same, then the Bible would explicitly come out and say that! The problem with this way of thinking is that it assumes the narratives of the New Testament should behave in the same manner as modern histories and biographies. Sadly, this misguided expectation mirrors a type of cynical and crass skepticism, that encourages critics to dump all of the Bible, simply because the Bible supposedly fails to measure up to “our” modern expectations of what good history and biography should look like. When we are reading the Bible, we must keep in mind a basic principle of Bible interpretation: The Bible was written for us, but not to us. “Face value” readings of Scripture often ignore the context in which the biblical writers originally wrote. Confusion over what interpretation of the Bible is best, often arises, because not enough attention has been paid to literary and historical context. 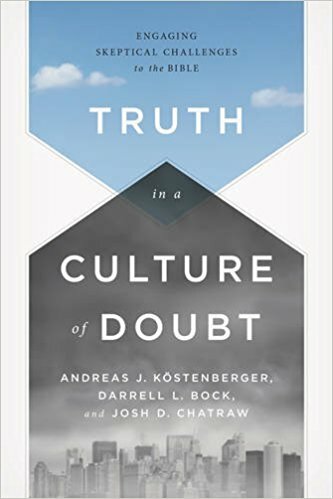 The presuppositions of believers and critics alike must take into account the evidence for the prevailing literary practices of the first century, and resist the tendency of anachronistically imposing certain standards on the Gospel writers, that they had no conscious intention of ever meeting. Norman Geisler’s views are published in his Galatians introduction, as found in A Popular Survey of the New Testament. Darrell Bock’s views are published in his Act: Baker Exegetical Commentary on the New Testament. Aside from his New Testament blog, I am not aware of where/if Mark Goodacre has put his ideas into print. My Veracity blogging colleague, John Paine, recently referenced New Testament scholar Dan Wallace’s response to Newsweek author Kurt Eichenwald’s Christmas tirade against Christian “misunderstandings” of the Bible. Sadly, despite some of the genuine substance Mr. Eichenwald displays to the reader, it is the Newsweek piece itself, “The Bible: So Misunderstood It’s a Sin,” that bears most of the misunderstanding. Michael Kruger (Reformed Seminary in Charlotte, N.C.) has two articles (#1 and #2 ), but what is most valuable is that Mr. Eichenwald offers some rejoinders to Kruger’s critique in the comments section. Ben Witherington (Asbury Seminary, Kentucky) offers a response from an evangelical Wesleyan perspective. For a response from the more conservative wing of mainstream Protestantism, this detailed response from Robert Gagnon (Pittsburgh Theological Seminary) fills in some of the gaps left by others in their critiques. Kurt Eichenwald has repeatedly said that some of the responses to his Christmas essay from Christians were loaded with “vitriol” and “name calling.” Perhaps Eichenwald has this series of video responses in mind ( you have to scroll past much of the unedited chatter in places, but you can look here: #1 and #2)by Reformed apologist James A. White (Alpha-Omega Ministries), but I will let the viewer be the judge of that. 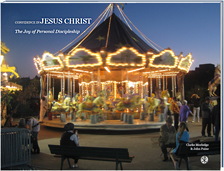 In addition to the well-known agnostic Bart Ehrman (University of North Carolina, Chapel Hill), Mr. Eichenwald leans heavily on the critical views of Jason David BeDuhn, professor of Comparative Study of Religions, at Northern Arizona University. BeDuhn, in this essay, responds to a critique of the Newsweek article by Southern Baptist Seminary head, Al Mohler. If you want to know what the more progressive end of Christianity is thinking about this, read this by blogger Rachel Held Evans, or this from Old Testament scholar Pete Enns. In my view, the best and most thorough response is from Darrell Bock (Dallas Seminary). If you only have time to read one of these, pick either the Dan Wallace one linked above or this one by Bock. The latest response from Newsweek itself is that they agreed to publish the following rejoinder by messianic scholar Michael Brown. In Newsweek’s introduction to Dr. Brown’s essay, they still stand by Eichenwald’s original story, in an effort to promote discussion. Furthermore, they announced that Dr. Brown has invited Mr. Eichenwald to be on his Line of Fire radio program the week of January 19.